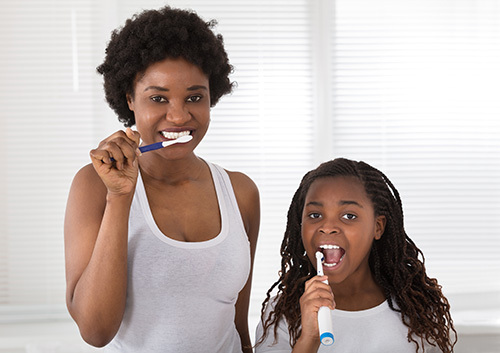 The best brushing routine for parent and child is two minutes of gentle brushing in the morning and two in the evening. But if the longest four minutes of your day are spent helping your child brush and floss, here are some suggestions for making that time fly. Children’s brushes come in a wonderful variety of colors, patterns, and shapes. Allow your child to choose a favorite the next time you go shopping for dental supplies. Just make sure to choose a soft bristle brush with a head designed for small mouths. And since toothbrushes generally wear out after three months, your child will have plenty of opportunities to pick and choose! You might also explore the many flavors of children’s toothpaste to find the one that your child finds most appealing, and let your young brusher squeeze out a dab on that new brush. You don’t have to go to great lengths to make your son or daughter feel rewarded for a job well done. Allowing children to pick out a story for you to read or posting colorful stickers on a calendar sheet will encourage them to get into the habit of brushing. Time seems to go faster when we’re having fun. Your child might enjoy listening to songs or stories for the two minutes of brushing time. You can make your own playlist, invent a story starring your child, or make use of one of the dental apps that offer children’s music, videos, and stories in perfect two-minute segments. Spend these two minutes twice a day with your child. You will be doing all the brushing at first, of course, but as your children get older, brush your teeth along with them. You can model proper brushing techniques for cleaning teeth, gums and tongue, and even let your child have a chance to brush your teeth for a change. Scheduling checkups and professional cleanings at our Federal Way, WA office is vital to maintaining your child’s oral health. And, if your son or daughter is keeping up with good hygiene at home, these visits should be a breeze! The habits your child develops now will be the foundation for a lifetime of oral health. Make these four minutes a day count. And if you can create ways to make them fun, those four minutes will fly by for both of you!